The practice of writing under one or more “alter egos” is nothing new to the literary community or the online world. Yet many authors are still unsure if the use of a pseudonym is appropriate for them. Their concerns stem from a variety of ethical considerations as well as a lack of understanding about the correct and effective use of a literary double. When you want to appeal to a regional demographic. By making your pen name more like common names in the region, your content will be better received as an insider. When your real name is way too difficult to remember, spell or pronounce. When your message will be taken more seriously if written by the other gender. When you want to avoid over-exposure of your real name or to write from potentially conflicting viewpoints. When you need to create different Expert Author pen names for diversely different niches. In this case, a simple variation on your name is often enough to prevent confusion. When you’ve hired a ghostwriter and want to isolate your real name from works produced by them under a ‘work for hire’ contract. Don’t try to assume a pseudonym similar to a current notable expert in your niche. If you are the buyer of exclusive rights content, don’t let your ghostwriter choose your pen name. Don’t use a nickname or “handle” – your pen name should sound like a real human name. Remember: When possible, use a variation of your own name. You create strength, confidence and credibility when you write articles under your own name, especially if you’re driving visitors directly to your primary website. Click here for a few tips on how to create multiple variations of your real name. 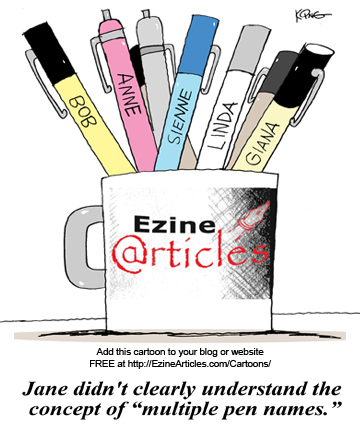 Leave a comment and tell us about your experiences with alternate pen names. You cover some really useful points here in your blog. I`ve never thought about using a pen names so far, but I can understand now why some writers do choose to. Thanks for this post. I’ve been considering using a pen name to write about a different niche so this has certainly helped to shed some light on this topic. Using one or more pen names gives me the freedom to choose different niches, and I like that. I’ve even taken it one step further and created Twitter accounts for some of the other pen names. Some people with multiple personalities might find this useful. I have a question about writing as the opposite gender. I’ve done some research about a topic I personally face but it seems that it will be better to write articles in the female gender to appeal to that audience. 2. Can I use a picture of a female? say of a friend of mine that has given me permission to do so. I’m thinking of using pen names for different niches, also. I wonder about using borrowed pictures also and didn’t see a response to your question. Your goal in article writing is to create a relationship with your audience by building trust and credibility in your niche. Using someone else’s photo does not do this nor is it advisable to use a photo that is not of you or does not have you in it. I am being hired to ghostwrite articles for a client. Can I use their name as an alternate author name? They give me the topics they want to have articles written about and I rewrite them in an appropriate style. I was wondering if I can do this through my EzineArticles account. In ghostwriting, you relinquish the rights to the articles after you have written them. The more appropriate action would be to have the owner of the articles submit them on their own account. You must have 100% exclusive rights to the articles you submit. You wouldn’t have that in this case. I’ve just launched website a called kitchenknifeguru.com about caring for kitchen knives. I was planning to write articles in this topic under a pseudonym of KitchenKnifeGuru, but it looks like your guidelines will not allow or strongly not recommend it. My main reason for wanting to do so was in one of your bullet points: “When you want to avoid over-exposure of your real name. . .”. I have an MFA in creative writing and still have the intention of publishing works of fiction. I would kind of like to protect my actual name. Do you have any suggestions or recommendations as to how to proceed? I’m thinking maybe I could use Nate O. . Thoughts? I’ve created my primary account, since then I’ve learned about pen names. I have to say it’s a very good idea and I really do wished I had a better understanding when I was creating my primary account. Now, I have created some “pen names” and I would like to move some articles from my primary account over to my pen name(s). How would I go about doing that? I’m afraid it’s not possible to move existing articles from one author to another. Articles written under a particular author name must stay under that author name. If I deleted or removed them, would I be able to re-submit under my pen name? would it create a duplicate content, how could I get around it? I’ll have our Member Support Team contact you directly via email. They’ll be able to help you out and answer your questions. “Unfortunately we cannot move articles to a different author name once they’ve been published, nor can we accept them again if they are deleted to be resubmitted under another name. The reason for this is that once an article is published under a name, that name is effectively the copyright owner. In my case, I think the solution to me is that, I will delete all my articles, then I’ll rewrite and submit them under the correct pen name(s). as Jenna points out I’ve only got 5 articles, this solution workable. For others with substantially more articles it might be something you have to live with. I’m actually thankful it’s only 5 articles.